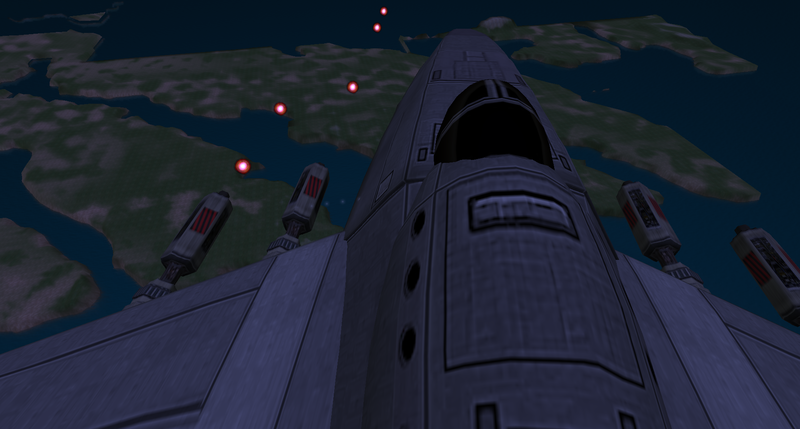 I’m not thrilled with the changes in opensim, but they DO have one up-side …variable regions. That means that you can have a huge area for a sim …acres or even miles if you have the ram and cpu power. Only a few, modern viewers support them, and it’s nearly impossible to create and edit on them -I’ve taken to working on a 512×512 region or metropolis’ Sandbox. I’m slowly, slowly, slowly getting Arcadia’s flying things to work by dropping Christy Locke’s Bulletsim script into them. I’ve got two vehicles set out and a third one (pictured) in progress. I have a fourth one which I hope will be epic. Due to technical glitches (an sql backup wouldn’t restore), the suburb project is put on hold. I’ve been playing with virtualisation again. It turns out that vmplayer either uses video pass-through or something very much like it. This means that on Linux, with proprietary drivers, I’m able to use a viewer in a VM and get 20-35 fps on the lowest setting, Pretty respectable -particularly compared to VB’s 2-10 fps. I have tinkered and gotten early opensim versions to work on ubuntu 08.04, but haven’t managed to get any viewers to really work. I’d like to create an all-in-one open source VM for people to sample opensim with, but that’s a HUGE undertaking so it’s probably more reach than grasp tbh. On a personal level, I feel the fall coming on, which means I’m tired more often than not. I believe that I’ll get some stuff done before winter (some vehicles set out in metropolis, if nothing else), but it feels to me like 2014 is winding down. Which is sad because I don’t think I have many years left. I'm a virtual world resident; I build, I organise, blog and play with server software (so far whitecore sim and opensim). Considering yesterdays big news, you take care of yourself, ok? I’m gonna, and with luck I’ll be hale and hearty for a while. Ooo ah; mother should I build a wall?